Construction of a new, two-way protected bike lane along Garry Street with connections to the Exchange District on Notre Dame Avenue, Princess Street, and Arthur Street is underway and is expected to be complete in 2019. When complete, the new protected bike lane will provide a safe link from the Assiniboine Avenue cycle track to the Exchange District. The two-way bike lane will be physically separated from vehicle traffic, enhancing safety and comfort for all users. The project includes street pavement rehabilitations and resurfacing on Garry Street between Assiniboine Avenue and Notre Dame Avenue and Notre Dame Avenue between Portage Avenue and Princess Street, as well as the resurfacing of Princess Street between Notre Dame Avenue and William Avenue benefitting motorists, cyclists and pedestrians alike. New tree plantings, increased bike parking and site amenities throughout the project area will be included. Also included is a pavement reconstruction and streetscaping on Donald Street between Portage Avenue and Notre Dame Avenue started in 2017, expected to be completed in 2018. Additional construction along McDermot and Bannatyne Avenues will take place as part of the West Alexander to East Exchange Corridor project. For more information please see the West Alexander to East Exchange Corridor web page. Completing the new downtown bike lane will include a full renewal of Garry Street/Notre Dame Avenue and upgrades on Princess Street and Arthur Street that will be completed in phases. Construction will continue starting in spring 2018 through the 2019 construction season. Construction notices advising of local impacts such as temporary lane closures will be posted in the Project Updates section in advance of each construction phase. Businesses and other area stakeholders will be notified directly in advance of local construction. Construction in McDermot and Bannatyne intersections from Waterfront Drive to Furby Street as part of the West Alexander to East Exchange Corridor project. A minimum of one lane of traffic shall be maintained on Donald Street, Notre Dame Avenue, Garry Street and Princess Street during construction. Additional lanes of traffic will be maintained where possible. Pedestrian access will be maintained to the extent possible. Prior to interruptions to access the applicable property owner will be notified. Parking on the street will be prohibited in construction zones as needed. Loading zones will be maintained where possible. Accommodation for cyclists will be made during construction to assure their safe passage through the construction zones. Phase 2 construction will resume in early May. Work includes Garry Street from Portage Avenue to Assiniboine Avenue. Work on Garry Street will include; removal of the existing asphalt overlay and placement of new asphalt overlay; pavement joint and slab repairs as required; construction of a new protected bi-directional bike lane on the east side of the street; curb and sidewalk renewals; and, installation of new streetscaping elements (pedestrian lighting, bike racks, sitting benches and trees). Phase 2 will also include completing minor work remaining from Phase 1 including landscaping, streetscaping and ornamental lighting. View the construction notice. Construction of the Downtown Bike Lane System and Street Improvements project will resume in mid-May. The project will be completed in two phases. Phase 1 construction is anticipated to take place during the 2018 construction season, with phase 2 taking place during the 2019 construction season. For more details, please see the April construction notice. Construction of the Downtown Bike Lane System and Street Improvements project will start up again this spring. The project will be completed in two phases. Phase 1 construction is anticipated to take place during the 2018 construction season, with phase 2 taking place during the 2019 construction season. For more details, please see the February construction notice. Construction notices related to work in the project area will be posted here prior to construction. If you have questions about road renewals or want to receive construction notices via email please contact Debbie Hillman at AECOM Canada 204-928-7445 or Debbie.hillman@aecom.com. Downtown infrastructure improvements, including construction of a new downtown protected bike lane, are beginning this summer. For more information, please see the June construction notice. The chosen design for the new downtown bike lane is the product of a multi-stage public engagement process that took place in 2015 and 2016. Included in the project are new security bollards for the Winnipeg Police Service Headquarters. An earlier phase of the downtown bike lanes project—a new bike crossing on Main Street to create a cycling link from Assiniboine Avenue to The Forks—was constructed in 2016. 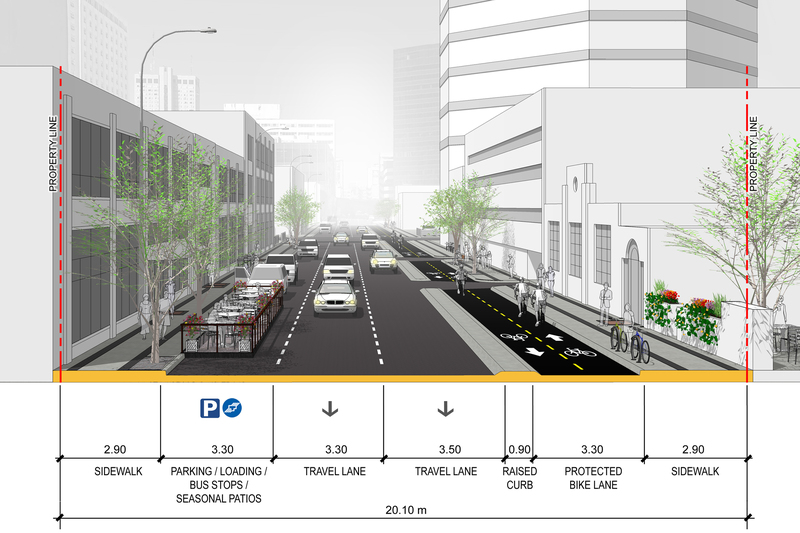 The Downtown Bike Lane System reflects the long-term policy framework set out in Winnipeg's Pedestrian and Cycling Strategies, which were approved by Council in 2015. These strategies serve as a roadmap for civic investments into infrastructure and active transportation support programs in order to make walking and cycling safer, more convenient, accessible, and attractive to citizens. Three phases of public engagement, beginning in September 2015, preceded selection of the final project design. View materials and reports from the engagement process. How was the final design for the Downtown Bike Lanes Project chosen? The final project functional design was selected in 2016 following a detailed study of the project area, including a multi-phase public engagement process in 2015 and 2016. Public input was collected through a public engagement website, stakeholder meetings, community workshops, streetside "tire talks" with cyclists and open houses. Feedback received during this process directly shaped the final design. How will this project enhance safety? Separating cyclists, pedestrians and vehicles is the safest way to accommodate each mode of transportation on a busy street. Apart from safe, separated lanes for all users, project improvements include enhanced street crossings, upgraded lighting, trees and street furniture. The City is committed to creating a pedestrian and cycling network that is safe and accessible for people of all ages and abilities. Will the new cycling lanes connect with existing cycling routes? Yes. When complete, the upgraded cycling lanes along Notre Dame Avenue/Princess Street/Garry Street will intersect with the Assiniboine Avenue cycle track, providing a seamless link through downtown. The new crossing at Main Street (completed in 2016) and an enhanced crossing at Portage Avenue will ensure continuity through downtown and between The Forks and the Exchange District. 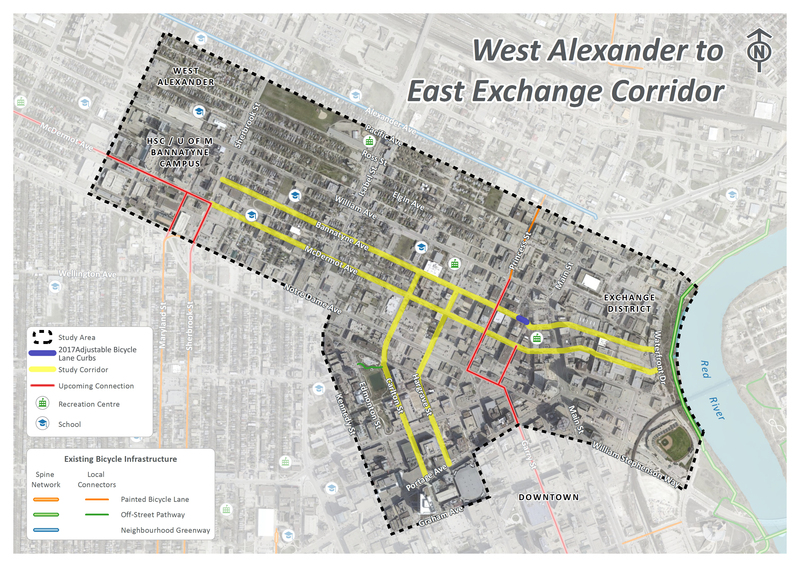 How will the West Alexander to East Exchange Corridor tie in with the Downtown Bike Lanes project? 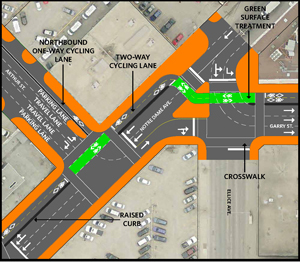 Upgraded cycling routes on McDermot Avenue and Bannatyne Avenue will ensure an enhanced connection to the Downtown Bike Lane System. The West Alexander project work will cross the Downtown Streets project at the intersection of McDermot headed east at Princess Street and Bannatyne headed west at Arthur Street. How will pedestrians and motorists benefit from this project? Notre Dame Avenue and Garry Street will be completely renewed and Princess Street resurfaced. The street work will include reconfiguring vehicle lanes and sidewalks to better accommodate all users. Streetscape design will review the inclusion of additional trees, bike racks and other site amenities. How will the location of improvements like additional trees and bike parking be decided? The City is currently confirming where underground utilities and other factors may limit where trees and other street furniture can be located. Once this information is known the City will work with area stakeholders to identify specific locations where bike parking and trees are desired and will be most beneficial. Will there be a loss of on-street parking and loading zone space? Local businesses and other area stakeholders were directly consulted to ensure that improved cycling infrastructure balances the needs of area businesses. The final design maintains as much on-street parking and loading as possible. I thought this project was supposed to be completed in 2018. Why will it take until 2019 to complete? As the project design process progressed, it was determined this complex project needs to be undertaken over three construction seasons in order to properly coordinate water main renewals, utility work, road renewals, bike lane construction, as well as streetscaping, lighting, and pedestrian environment enhancements. The City will make every effort to complete this project as soon as possible and is committed to providing timely communication about construction to stakeholders. Prior to any construction taking place, notices will be distributed to those residences/businesses directly affected. How will pedestrians and cyclists be accommodated during construction? Pedestrian access will be maintained to the extent possible, any interruptions to access will be reviewed with the applicable property owner prior to the disruption. Accommodation for cyclists will be made during construction to assure their safe passage through the construction zones. In July 2015, City Council adopted the Winnipeg Pedestrian and Cycling Strategies. This document stems from the 2011 Transportation Master Plan. The Strategies provide a long-range policy framework for active modes of transportation in Winnipeg for the next 20 years. Following public engagement in 2013 with more than 3,000 Winnipeggers, the Strategies assist in the prioritization of walking and cycling infrastructure projects city-wide. How much of the project construction will be completed in 2018? I live/work in the area when will I know if I am going to be affected? All efforts to complete a large portion of the construction in 2018 will be made and updates to the website will be ongoing. Specific timelines for future construction will be provided prior to construction start in 2018. To receive notices confirming future construction details and timelines, please sign up for email updates via Debbie.hillman@aecom.com. Why is it so complicated? Can’t the City put up pre-cast concrete barriers like Calgary and Edmonton and get the bike network built more quickly? The City has a proposed grid of permanent protected bike lanes in the Downtown core, as approved by Council in the Pedestrian and Cycling Strategies. Progress on the high priority Downtown network is being balanced with other priorities in the Pedestrian and Cycling Strategies including closing gaps in the city-wide network to connect to the Downtown core and other key destinations. Additionally, many of roads and sidewalks in the Downtown are in poor condition and do not meet current accessibility design standards. In order to create safe, accessible infrastructure for cyclists, pedestrians, and all users of the streets, these roads and sidewalks need to be renewed.